If your little guy has always wanted to serve and protect, he has quite a long time to wait. He needs to be 21 in most states, but given how long it’s taken him to make it to seven, we’re guessing he is getting impatient. We have just the thing for you. 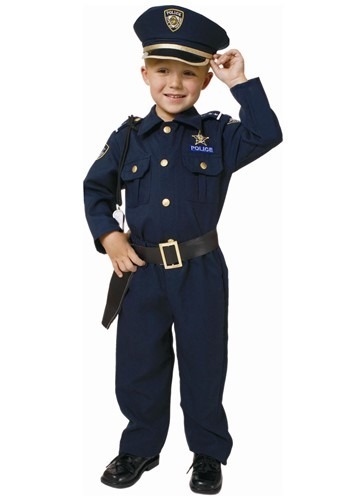 This Child Deluxe Police Officer Costume is guaranteed to make him feel like a part of the force without, you know, needing to take a hard test, go to college, or age fourteen years overnight. You will absolutely make his day with this authentic ensemble and he can go about channeling his energy into other officer-like traits: being a standup brother, an honorable citizen of your household, and a classroom leader. Before you know it, he’ll be standing up to bullies, protecting his little sister, and eating his fair share of donuts (well, he already does that one without the suit!) You’ll love his commitment to integrity and honor, and he’ll look adorable as he tries to become a little hero for you and your family! Of course, the right attitude only gets you so far--he’ll need the right uniform, too. Our navy blue outfit has all the patches and badges you’d expect from a real life officer of the law. We told you we had the perfect solution for you! Rather than tipping his police hat to us in thanks, maybe your little guy could repay us in another way; we have a few speeding tickets he could take care of!